Epson t1285 ink cartridges have been well-known because of providing outstanding print out for a long period of time. For getting the print outs of financial records and important documents they have demonstrated to be tremendously valuable and competent. The ink cartridges Epson t1285 are the life of any functioning printer. In case you have an Epson copier then make use of the Epson ink cartridges as they are compatible to them. Epson cartridges have quick-dry ink that does not blotch on the paper. 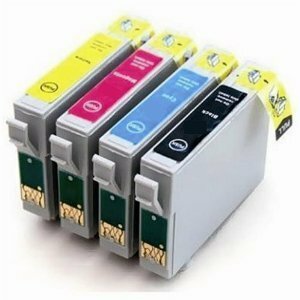 What are OEM (original) Epson T1285 ink cartridges? 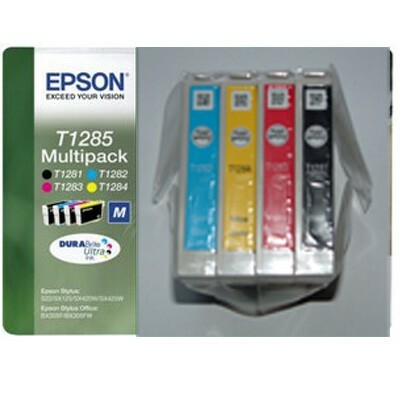 OEM (Original Equipment Manufacturer) Epson T1285 ink cartridges are manufactured by the maker of the printer. OEM products offer excellent quality, however at very high price which is not affordable to everyone. What are compatible Epson T1285 ink cartridges? Compatible T1285 cartridges are made by third parties as replacements to the originals. They are designed to work the same way as OEM cartridges. Our high quality compatible cartridges offer as good quality as OEM products at much lower price. Our compatible Epson T1285 cartridge come with the latest chip and work the same way as original. They are filled with highest quality ink (which is made in US) and gives best performance as originals. You will save 50% or more on the cost when using our compatible cartridges comparing with originals. Our Epson T1285 ink cartridges have up to 18 months shelf life and we offer no quibble 12 months warranty. No. Our T1285 compatible ink cartridges have been tested thoroughly to make sure they will work flawlessly with all supported printer models. Also the cartridges are filled with highest quality ink which is made in the USA to give the best protection to print head. Will using compatible Epson T1285 ink cartridges void the printer manufacturer warranty?